← Duck Norris is not impressed. I can’t believe I said that, right when the Universe was listening. I swear we don’t go more than a few weeks without having to turn up to the vet with one of the animals. Now when I call them, they actually recognise my voice. My Father in Law once suggested we buy a veterinary practice and I dismissed it, now I’m thinking he might be the smartest man alive. Now, I am absolutely aware of how the Universe works. I know it has a completely warped sense of humour, so WHY would I say “Well, at least the ducks have been great, none of them have even needed to go to the vet yet” OUT LOUD right when the Universe was listening? The Universe usually responds very quickly, so when I walked outside two days later and saw Quackmire limping, I shouldn’t have even been surprised. We picked him up to have a look at him and he now says he has called a lawyer because he is suing us for kissing him on the head and saying he has “the cutest little face in the world”. He is mortified and thinks we have ruined his reputation with the rest of the flock. We told him he’d need to go to the vet and Cleoquacktra insisted he would need to fill out a hospital admission form so they didn’t amputate the wrong leg. He freaked out a bit, but I convinced him they were NOT going to cut anything off and he was over-reacting. 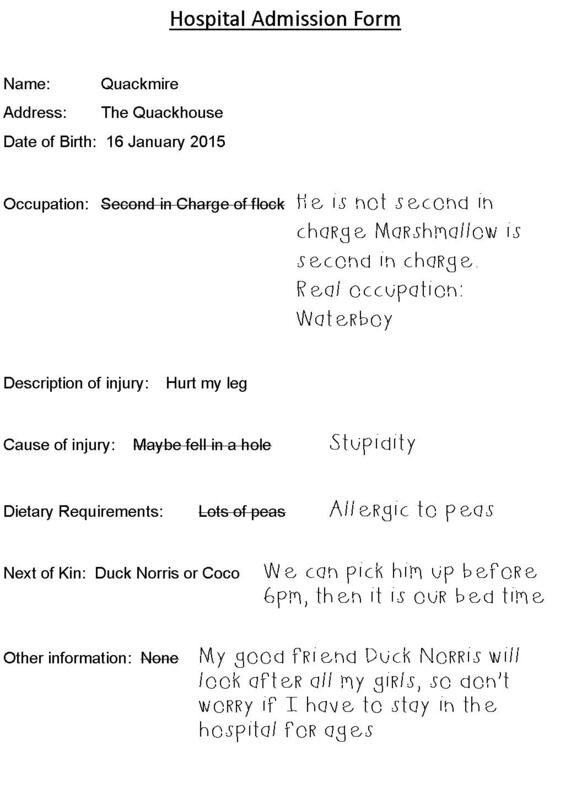 He filled out the form she gave him, but unfortunately he got Duck Norris to check it for spelling errors before he handed it in. My credit card spends more time out of my purse than in it. We should probably just leave it with the vet to save time. I can see how that would be annoying. I can’t believe they really think Norris is a wonderful leader, though. Surely they’re just to afraid to speak out?